Innovative custom packaging can be created for many industrial and consumer applications using Petro’s clear plastic tubes with sealed bottom. Utilizing the finest raw material selection in the industry, Petro manufactures superior quality, crystal clear tubular shapes to optimize your products visual impact. With one end of the tube permanently sealed, the consumer is provided with a protective, reusable tube package. 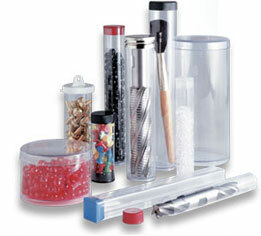 Our sealed bottom tubes insure that your valuable products reach their destination intact and undamaged. Unlike injection molded vials, this made to order package allows the customer to specify the exact tube length for a perfect product fit. With the application of a single cap, this tube package reduces labor assembly costs, clearly making it the ideal, economical packaging solution.